Torso pitch: -30° to +35° while standing. -30° to +45° while crouching. From the far reaching cLRM10, dependable cGauss, the trusty Lubalin auto cannon, over the ERMBL duo down to the (only) 350 meter far reaching cSRM4 missile launcher, this unit's firing solution has ever more weapons at disposal as the enemy draws near. Of all that arsenal only the cLRM mandates the use of active radar on the longer range, this might designate this unit stealth capable to a high degree. The main problem might be to most efficiently group the various weapons on the usual three weapon groups. It's main selling point is the versatile arsenal, not heavily taxing the heat sinks while offering quite some punch from long to close range. It's main drawback is the riddle of grouping it's versatile weapons arsenal to least possible weapon groups. Let us hint you - the LB-5-X and the CGauss have similar ranges while the LBX has enough ammo to spare an occasional futile shot. B-Pod helps with Battle Armor ambushes. It depends on the view. Viewing this unit as yet another skitzo does it no good. It is a brawler by hart, and one with a ranged punch of no less than 900m of twin cERLBL pinch. Everything else is short ranged steamrolling firepower. cUAC20, cSRM6, a pair cSPL all in accord and of short reach. Make no mistake, the two large lasers are nothing less of a threat within 450m range of the other weapons, they merely aren't as urgent to be used while lending quite some time to aim at an (potentially) fleeing target. The units main selling point is having an brawler with no remorse for an fleeing or distant foe. The asset worthy of an true lance commander - two CERLBL that punish up to 900m afar - with pinpoint and hit-scan accuracy. Even further the two CLRM15 Locks On out to 1000m and travel 1470 meters, combined with CNARC up to 700 meters, provides for control for who's NARC-ed and who's not. However, the TAG with a reach of 1300 meters facilitates prolonged target designation even in events of NARC disruption. EOptics and BHP ensure hunting will be a pleasure while the LAMS safe guard you from incoming missiles, though will also give away your position. The one Free Ton best used for additional CNARCs. Selling point? Are you The Master of Puppets? Can You afford it? Yes? What are You waiting for? Focusing on precision medium range skirmishing, the C variant packs a HAG30 for long range deterrence or shorter range component removal. Two ATM6 bring splash damage and cockpit shake inside 750 meters. Once shorter distances have been achieved, a trio of CMPL rapidly exploit the holes punched by the HAG and ATMS. This variant shines at the 400-600 meter range, preferably using cover to approach to bring all three weapon types to bear. The single spare ton of ammo rack space should always be dedicated to the HAG as it is deadly at any distance. Care must be taken that opponents do not get inside the ATM-6's 125 meter arming range, though careful pilots can use the HAG to devastating effect at short distances. One could mistake this variant for an average all around ranger. And be gravely wrong by doing so. Each of its two cLRM10 launchers is more than capable of medium to borderline close range combat. Let alone the cERPPC or the close-range synergized LBX20 and 4 ERSBL. Firing an alpha attack to targets within 450m range is ultimately devastating both to your victim and your coolant reserves. Utmost caution is to be taken to not de-NARC and designated target by the mighty ERPPC, to avoid the wrath of fellow target designator. A precision focused brawler, the E fields a wide array of short to medium range weaponry. From 600 meters out, both a CHLL and CUAC10 can provide heavy damage, though are best used independently against smaller targets due to the long duration of the Heavy Laser and flight time of the Autocannon shells. Opponents that close further face two Heavy Medium lasers, and four CSRM2's. The four SRM2's are best chain fired approximately every second for maximum cockpit shake. Precision targeting must be used due to the differing lead times of the four weapon systems, though careful pilots are rewarded with consistent, heavy damage. While the E can pack a punch, care must be taken as the Heavy lasers and UAC10 both generate copious heat. Long engagement times can also prove problematic due to the chassis's large torso; pilots are advised to rotate armor when possible lest they fall to the same precision fire required to utilize this variant. Nicknamed "Saito", a sibling to the Vulture E, this 'Mech is also an SSRM-boat. It trades the two DSSRM6 racks of the Vulture for a trio of DSSRM4s, giving slightly more shots before requiring a reload, while trading the MPLs for a HAG20. 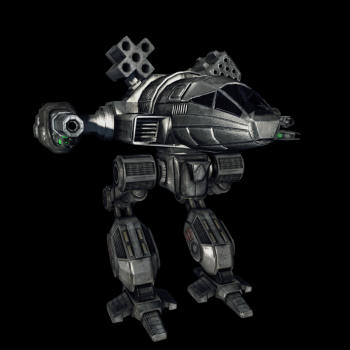 The two ERSBLs are retained on this 'Mech and are useful for delivering the last couple points of damage to score a kill. Generally, this Cauldron Born will perform slightly better in a brawl due to the additional screenshake and burst capability of the HAG. It pays for that in having inferior mobility in comparison, slightly less ammo and being more expensive. Overall, the F will give you slightly more durability and greater punch for a similar heat profile to the Vulture E, provided you can afford it. "ChiliDog" is relatively unique among heavy 'Mechs -- it carries both MASC and GECM, giving it incredible submerged mobility and is one of the best 'striker' 'Mechs available. Combined with its short-ranged loadout featuring two MPLs, two HMLs, a pair of SRM4s and a shoulder-mounted ATM9 with HE rounds, the G can rapidly flank opponents, run down fleeing targets or charge into a battle from an unexpected angle. With eight DHSes, a pilot can maintain MASC for extended periods of time or lean on their weapons almost continuously -- skilled pilots can run this variant right on the brink of overheating, wringing as much performance as possible with judicious use of coolant when needed. Unfortunately, the G will fare poorly when placed against a dedicated brawler in its price bracket and like most Cauldron Borns, the poor turning radius can be very problematic in a circle-strafe situation. 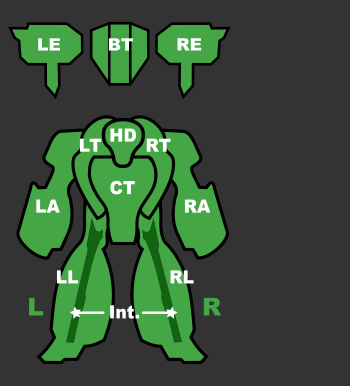 It is also not well-suited to fighting from behind cover in a more static combat scenario. Use your speed with MASC to fall back if you stumble into more resistance than you expected. Introduced in 3049 to address flaws in the venerable Hellbringer, by Operation REVIVAL the Ebon Jaguar had only just started to spread through the Jaguar's touman with the Inner Sphere first encountering the design during the Battle of Luthien. Facing it for the first time when engaging the First Jaguar Guards Cluster in the Kado-Guchi Valley, the 'Mech's ability to take damage and remain operational led the Inner Sphere warriors who fought it to call it the Cauldron-Born after the unstoppable zombies of Irish myth. Paradoxically many of the other Clans also used the Inner Sphere Cauldron-Born reporting name, having first learned detailed information of the design from Inner Sphere sources.